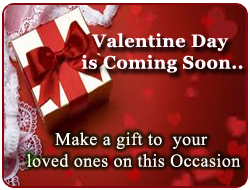 Do you want cute and romantic gifts from your sweetheart? Then, make a wishlist so as to give them an idea of what you like. Choose your gifts this Valentines day and help your partner?s buy gifts that you like. Here, we have some ideas for Valentine's day Gifts. Chocolate is the go-to gift for romantic occasions. you can choose your Perfume that you would love to smell. Flowers are always a popular choice for Valentine?s Day. Now there are wide variety of Valentine-appropriate flowers and gifts, available in the market. Choose your flower on that romantic day.